Facebook in March launched into beta a personal fundraising tool that allows users to raise money for themselves, a friend or someone / something not on Facebook (a pet, for example). 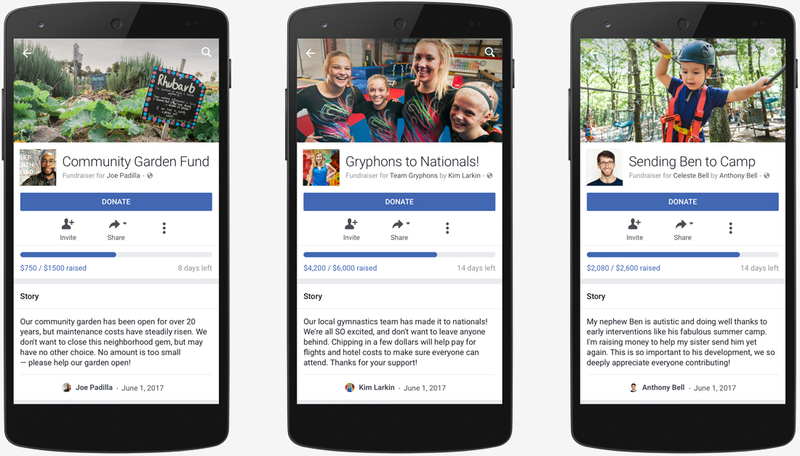 On Wednesday, Facebook’s VP of Social Good, Naomi Gleit, announced that personal fundraisers are expanding to everyone in the US (over the age of 18) and adding two new categories. While in beta, personal fundraisers were restricted to raising money for education, medical expenses, pet-related medical expenses, crisis relief, funeral-related expenses and personal emergencies such as theft, accidents or a house fire. Now, it’s possible to create a fundraiser for community events such as neighborhood services, community improvements and environmental improvements. The new sports category, meanwhile, can be utilized to help raise money for equipment, competitions and team-related fees. All fundraisers are subjected to a review process that can take upwards of 24 hours. It’s also worth pointing out that Facebook charges a 6.9 percent + $0.30 fee for each fundraiser. Proceeds are used to fund security and fraud protection measures as well as payment processing and fundraiser vetting. Gleit notes that the goal, at least with regard to taking a cut of funds raised, is to create a platform that’s sustainable over the long haul, not to turn a profit. More information on the matter can be found on Facebook’s dedicated fundraising page or via the “Fundraising” section of its mobile app.